Top food retailers and manufacturers have made their pledge to the latest Courtauld Commitment*. Now a respected UK packaging expert is calling on his industry to do more this year to help achieve the UK-wide commitment to reducing household food waste by 20% in the next two years. More than £10billion worth of food is thrown away in the UK every year – enough to fill Wembley stadium nine times over. Much of this waste is a consequence of misunderstandings over labelling and best before dates, and the recent developments in food labelling will help to address this issue. 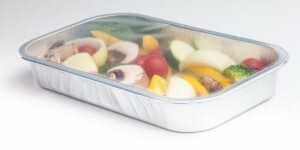 However, Charles Smithson, managing director of leading UK-based food packaging specialist KM Packaging, is convinced that the packaging sector can play a much more significant role in helping to extend shelf life and improving the integrity of packaging – all of which will significantly reduce waste. Courtauld Commitment 3 – funded by Westminster, the Scottish, Welsh and Northern Ireland governments and delivered by WRAP – runs until 2015, building on the first two successful phases and aiming to further reduce the weight and carbon impact of household food waste. Its impact is predicted to be a cumulative reduction of 1.1 million tonnes of waste, 2.9 million tonnes of CO2 and a cost benefit of £1.6 billion to consumers, the food and drink sector and local authorities. Nearly 50 leading retailers, brands and manufacturers signed up in the summer and collectively are expecting to influence a 20% reduction in household food waste. Charles Smithson is keen to stress the impact that food packaging can have on carbon lifecycle. Figures from PAFA (the Packaging and Films Association) indicate that only 1.2% of the average person’s energy (i.e. carbon) consumption is related directly to food packaging. However, the food supply chain as a whole accounts for energy usage ten times greater than this, meaning that protection of the food itself is an absolute priority. KM Packaging has also developed a number of film lidding solutions that provide ready meals with a shelf-life of up to 12 months. Ambient ready meals require lidding films that are oven-able and able to withstand rigorous retort processes – ensuring the contents are fresh and safe from bacteria – whilst also delivering superior peel-ability, exceptionally high barrier properties and incomparable film clarity. Mr Smithson continued: “Leakage is another of the industry’s biggest challenges. The seal between lid and tray is the weakest link and poor seals can lead to massive waste. One of the most costly culprits in this area is meat: food manufacturers are grappling with the rising product costs, which in turn has placed increased pressures on ensuring safety throughout the supply chain. One of the most common issues is the tendency of meat to release juices which, if lidding seals are not secure, can cause the pack to spread bacteria to surrounding goods, either in transit or on-shelf. In other words, there is significant potential for food packaging specialists to use their experience and expertise not only to reduce food waste by better presenting, protecting and preserving a comprehensive range of food products – but through these actions to also have a positive effect on the food industry’s carbon lifecycle and contribute directly to achieving the objectives of the Courtauld Commitment.